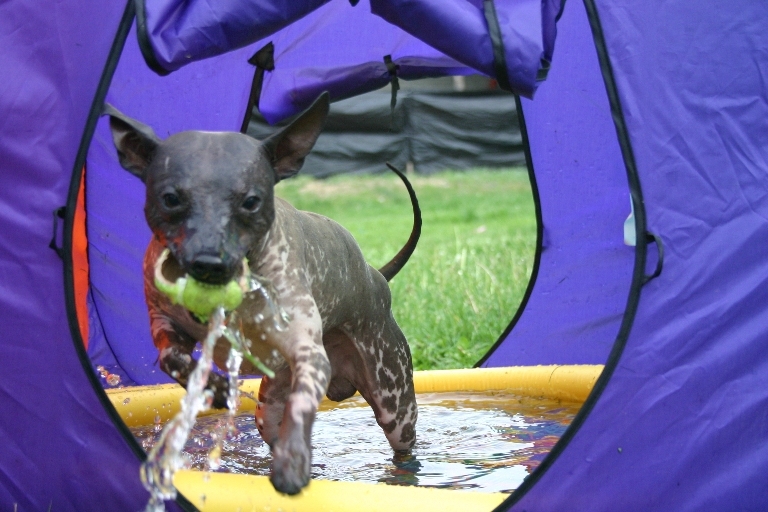 Welcome to our site for American Hairless Terrier breeders, owners and fans in Canada. We are Canada's original American Hairless Terrier Breeders and have been exclusively breeding Hairless and Coated AHTs since 1999. We are members of the Canadian Hairless Terrier Association and our group of caring, dedicated breeders share common goals and strive to breed happy, healthy, family raised dogs. As responsible dog owners and breeders we all work together in promoting this wonderful and very rare breed in Canada. ***PUPPIES! Our Scooby/Pinkee Litter was born on Aug 10 2007. Please visit our puppy blog at: http://valleyahts.blogspot.com to see pictures and puppy updates! For our Puppy application click here! SDK's Scooby McGurk enjoying a cool dip on a hot day!